A private person or company "can" start a case on e-Court without the assistance of a legal professional. This means he/she or the company will represent themselves. However if you feel you lack the expertise to do an adequate job then e-Court can refer you/your organization to a Lawyer, Barrister, Solicitor or Attorney registered with e-Court. When choosing your own legal professional make certain your counsel registers with e-Court. 1. You/your company select a legal professional. 2. Your counsel registers with e-Court. 3. The other party is invited to participate. 5. Within six weeks the official litigated arbitrary decision or a legal opinion is sent to both parties. 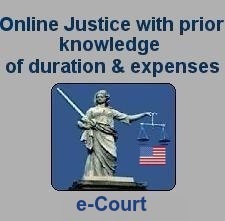 e-Court is quick, easy and inexpensive. We regularly inform you about the progress via email but full information is always available via this website. If you do not agree with e-Court's decision after having previously used the standard procedure, you can always decide to appeal. This procedure takes four weeks, hence the total procedure from start to finish will lasts no longer than ten weeks.